A Welsh artist is recruiting people to stand outside Cardiff City Hall looking miserable tomorrow from 1pm to 2pm. Barrie Davies intends the "sulkathon" to "capture the mood of the moment". The film follows Rhys through South America performing solo concerts, tracing the Welsh community's movements, and searching for Jones's great grandson, a 1970s Argentine pop star called René Griffiths, who would arrive on stage on a horse and sing in Welsh. This is only the backdrop to the personal journey at the heart of Separado!, which balances its weightier moments with a lurid visual style and a childlike playfulness. A dance sequence on a Welsh beach represents Michael D Jones's promise of a utopia; while a colour-saturated shot of Rhys jumping over a fence to escape an angry armadillo follows a recap of the excesses of the 1976 Argentinean coup d'etat. At one point, he performs for the elderly locals of Gaiman, Patagonia's most Welsh village, at their community hall. In this kitsch world of teahouses, chapels and daffodils in the middle of the desert, Rhys's experimental set is met with some understandable confusion. "It's remarkable that I can play a gig of Welsh language songs in South America and they understand what I'm singing about, even if they find the music a bit suspect," says Rhys, failing to mention that he performed much of it in a red spaceman's helmet while singing into an orange plastic cup. "There are Welsh road signs in Gaiman. Even an Italian restaurant will have a Welsh menu. It's fantastical, but the fact that I was there at all felt fantastical – the film needed to reflect that separation from reality." 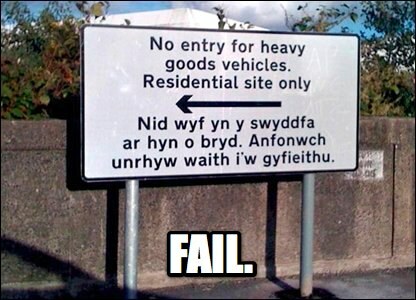 All official road signs in Wales are bilingual, so the local authority e-mailed its in-house translation service for the Welsh version of: "No entry for heavy goods vehicles. Residential site only". Which leaves a few questions unanswered: are there really so few Welsh speakers in Swansea that the council couldn't find one on staff to run the sign past? And surely a translation service would have made their out-of-office messages bilingual. Trading standards officers have warned the manufacturer of Welsh Dragon sausages that they could face prosecution because the sausages contain no dragon meat. The sausages, named after the national emblem of Wales, will now be named Welsh Dragon Pork Sausages. Jon Carthew, 45, who makes the sausages, said yesterday that he had not received any complaints about the absence of real dragon meat. He said: "I don't think any of our customers believe that we use dragon meat in our sausages. We use the word because the dragon is synonymous with Wales." I suspect that the only reason that British Lion Quality Eggs are not obliged to trade as "British Lion Chicken Eggs" is because more people know that lions don't lay eggs than know that dragons aren't farmed for sausage meat. Many of the small bands and record labels here are part-funded by the Welsh Language Board. Who knows what'll happen to that funding once the Welsh Language Board is shut down, folded into the rest of the Assembly by Rhodri Morgan's "Bonfire of the Quangos." But here's an example - the Board have just released the new "Dan y Cownter 2" CD, which anyone can have for free, showcasing 10 bands on 10 different labels. If you want a copy, just email post@danycownter.com. You don't even have to do it in Welsh. Review here. Sorry to sound like an advert, but it's an excellent thing. There is indeed a vibrant music scene in Wales (Jim played me some examples, from the early 1980s to the present day, when I was last in Aberystwyth, along with commentary and translations), and a lot happening there creatively, with both the eisteddfod tradition and local government funding helping. Of course, the key difference between Welsh and Swedish indie pop is that the Swedes usually sing in English. I guess it helps that the English never colonised Sweden and tried to extinguish its language. The Welsh city of Cardiff is experimenting with what could be the future of public transport. The ULTra system is somewhere between tranways and taxis, and consists of autonomous cars (large enough to carry several passengers and a bicycle) travelling on a dedicated track and taking their passengers to a destination of their choice. Meanwhile, Melbourne's airport rail link has been scrapped, because a study revealed insufficient patronage to justify the expense.